One of the most extraordinary survival stories ever told -- Aron Ralston's searing account of his six days trapped in one of the most remote spots in America, and how one inspired act of bravery brought him home. It started out as a simple hike in the Utah canyonlands on a warm Saturday afternoon. For Aron Ralston, a twenty-seven-year-old mountaineer and outdoorsman, a walk into the remote Blue John Canyon was a chance to get a break from a winter of solo climbing Colorado's highest and toughest peaks. He'd earned this weekend vacation, and though he met two charming women along the way, by early afternoon he finally found himself in his element: alone, with just the beauty of the natural world all around him. It was 2:41 P.M. Eight miles from his truck, in a deep and narrow slot canyon, Aron was climbing down off a wedged boulder when the rock suddenly, and terrifyingly, came loose. Before he could get out of the way, the falling stone pinned his right hand and wrist against the canyon wall. And so began six days of hell for Aron Ralston. With scant water and little food, no jacket for the painfully cold nights, and the terrible knowledge that he'd told no one where he was headed, he found himself facing a lingering death -- trapped by an 800-pound boulder 100 feet down in the bottom of a canyon. As he eliminated his escape options one by one through the days, Aron faced the full horror of his predicament: By the time any possible search and rescue effort would begin, he'd most probably have died of dehydration, if a flash flood didn't drown him before that. What does one do in the face of almost certain death? Using the video camera from his pack, Aron began recording his grateful good-byes to his family and friends all over the country, thinking back over a life filled with adventure, and documenting a last will and testament with the hope that someone would find it. (For their part, his family and friends had instigated a major search for Aron, the amazing details of which are also documented here for the first time.) The knowledge of their love kept Aron Ralston alive, until a divine inspiration on Thursday morning solved the riddle of the boulder. Aron then committed the most extreme act imaginable to save himself. 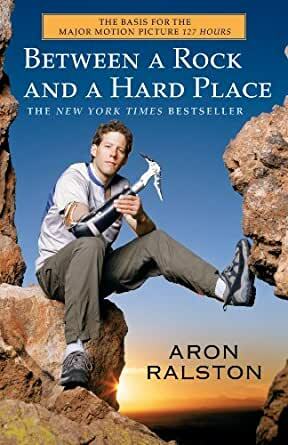 Between a Rock and a Hard Place -- a brilliantly written, funny, honest, inspiring, and downright astonishing report from the line where death meets life -- will surely take its place in the annals of classic adventure stories.